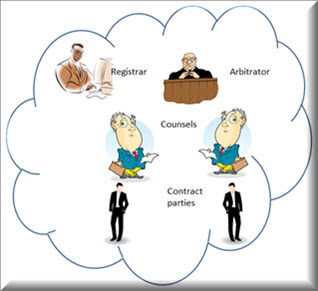 Virtual ODR is the modern way of conducting an Alternate Dispute Resolution or ADR which includes all dispute resolution mechanisms outside the conventional litigation in Courts such as Arbitration, Mediation and Conciliation. Disputes are best resolved when the parties are able to communicate instantly and clarify each other's position. A Virtual ODR process brings together all stake holders in one place for a virtual meeting across the table without the need to be physically present at one place as required in the traditional ADR process What is normally called as ODR in some circles involves only communication by e-mails. The featured service in this site involves the use of the Virtual Arbitration/Mediation room where the discussions take place, documents are presented, witnesses are examined, and arguments take place. It is a replication of physical meeting in virtual space. 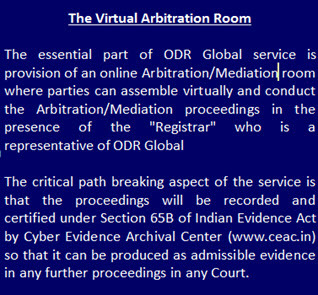 A critical parity breaking aspect of the service offered here is that the entire proceedings in the virtual ADR meeting is recorded with audio and video in the virtual presence of a representative of the service provider viz "Registrar" certifying the electronic document on behalf of Cyber Evidence Archival center (www.ceac.in) to make it an admissible evidence in any Indian Court according to Indian Evidence Act. (P.S: If the parties out of their concerns of privacy, so desire, the recording and the presence of the registrar can be dispensed with.) ADR is an useful process for dispute resolution to avoid the delays that are normal in traditional Court room litigation. ODR further cuts down the time for resolution and is ideal for "Fast Track ADR". Participants can join from any where with a just in time attendance. This provides cost savings by avoiding travel and hotel expenses involved in a traditional ADR meeting without diminishing the experience of a face to face meeting.